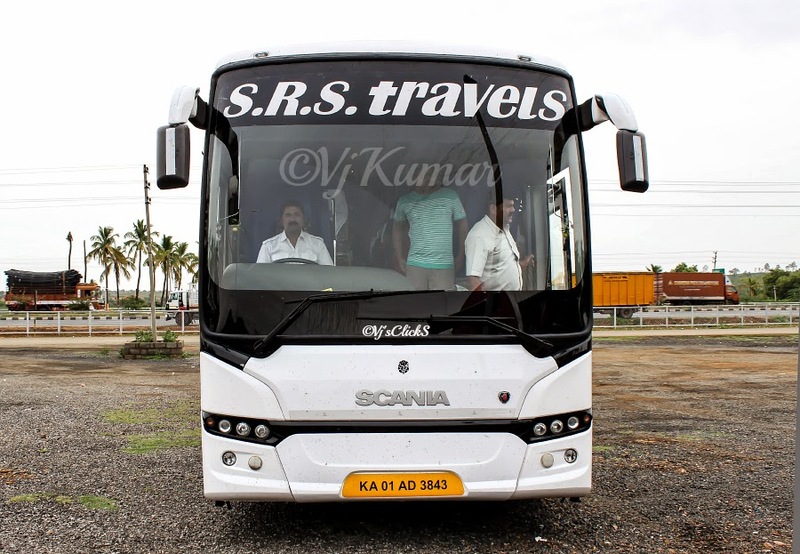 Schumi0101: My very first Scania experience from Pune to Bangalore in SRS Travels. 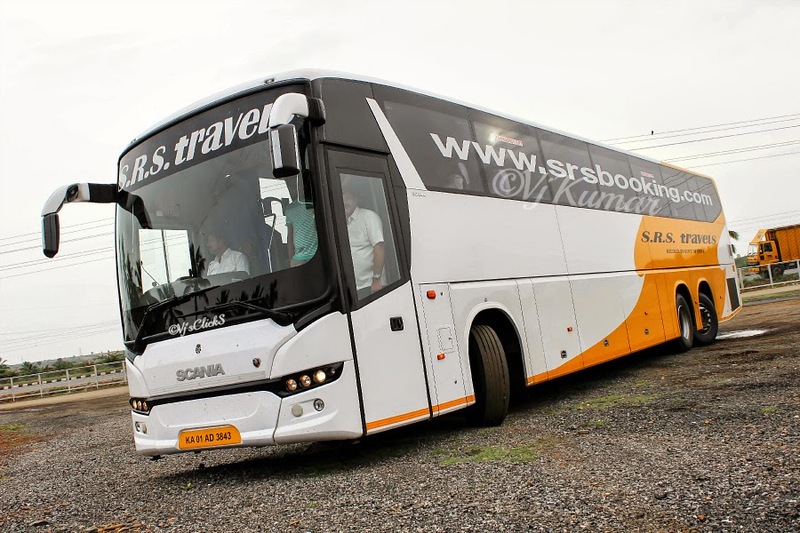 My very first Scania experience from Pune to Bangalore in SRS Travels. Scania Mania finally takes over. Ever since the launch of Scania buses in India, I was eagerly waiting for an opportunity to travel in these state of the art buses. Since I missed an opportunity last month, this time I took no chances. Since the plan to Shirdi was on the cards, careful and meticulous planning was done weeks before the journey to avoid any last minute hiccups. As planned, me and Deepak decided to catch an Airavat from Shirdi to Pune and later catch Scania from Katraj, Pune. It was a risky plan as traffic always plays a spoilsport however we decided to go for it. The plan however backfired at Shirdi as the seats on the Airavat Club Class were full. Thanks to the courteous Airavat Club Class crew who upon request allotted seats to Pune in their bus which was running full from Shirdi. Finally, both of us reached Pune (Katraj, Wondercity) at around 6pm from Shirdi. We were joined by Ashith Shetty and the wait for the bus seemed never ending. We watched many operators heading to Bangalore however our bus was nowhere in sight. The scheduled time of arrival was at 7:45pm. By around 8pm, she arrived at her pickup point. It was exactly a month ago when SRS introduced their Scania service and it was about time to experience the journey. The crew immediately recognized me as we both were a part of the marathon journey to Bangalore from Ahmedabad which we undertook last year. Myself and Deepak had booked seats A1, A2 and rest assured we knew this was a memorable journey in the making. We waited for another 10minutes and with all passengers accounted for we departed from Pune. The very first experience you feel when you board this bus is that it is nothing ‘Volvo’ like. The bus is powered with a 13000cc engine with 410hp. The bus was exactly a month old and had done around 31000kms on the Odo. The interiors too were very plush and the high deck seating is something that should be felt rather than being explained. As we settled down, we were joined by another SRS B9R and we began to climb the ghat to head out of Pune. The bus climbed the ghat effortlessly however was finding it difficult to match its (B9R) pace on a straight stretch as the bus was speed locked. We were joined by the 2nd driver and he recognized us from the photo shoot we had a month ago when the service was launched. Both the drivers gave the same feedback that the bus is both driver and passenger friendly. While we went ahead with the tech specs of the bus, we neared for our Dinner break. The dinner break was not short as the place was crowded. The crew gave ample amount of time for the passengers and after a 30minutes break, we returned back to the highway. This time the 2nd driver was at charge and I decided to take the co-driver’s seat to enjoy the rest of the journey as my sleep had given away. The co-driver’s seat is placed lower when compared to Volvo. Initially I found it difficult, however after a couple of minutes I felt comfortable sitting there. We continued our conversation about the tech specs and the passenger’s feedback about this bus and as we chatted along, the barrage of Volvo B9R’s heading to Mumbai and beyond started from the opposite direction. First up was SRS followed by VRL, Neeta, National, KSRTC and Konduskar. We were cruising at 85kmph and the driver showed no sense of urgency and ensured passengers had a sound sleep. We reached Kolhapur at around 12:10am and picked up passengers who were waiting for the bus. We entered Karnataka at around 12:45am and headed towards Nippani. The bus handled the steep stretch with no glitches as the diver kept the bus to the left lane to let go off fast moving vehicles on the right lane. We were nearing Belgaum when SRS’s Jodhpur-Bangalore B9R overtook us. We continued further and headed for a pit stop for fuel. The bus gulped around 157ltrs of Diesel for the rest of the journey. We reached back on the highway and finally I finally decided to get some shut eyes. I came back to sleep and the next thing I remember was waking up somewhere between Chitradurga and Hiriyur. It was around 6:20am. We continue further and finally stopped for the last break for the journey at Sira. Paulo’s MAN, Anand, SRS jodhur-Blr service, Sharma Leyland sleeper welcomed us. The breakfast stop was brief as Bangalore was now in striking distance. Needless to say that Volvo re-defined comfort, class and luxury to Indian travelers. Both Volvo and Scania have their own views in the area of technology, however they have both won hearts of people for being safe and comfortable. The comfort and safety levels of Scania buses too are top class. The only problem which the crew is facing currently is the ire of passengers as the bus is locked at 85kmph. However with the first oil change around the corner, this issue should be resolved. If you are looking for comfort and safety, this bus is a must try. I am eagerly waiting to try this service again. Such an awesome experience, when I was traveled via Bangalore to Pune, It was nice journey ever I had the bus tickets are very cheap in VRL Travels. Thanks for sharing this information. Dental Treatment is cost effective / inexpensive in India. For ex. average root canal treatment cost in Bangalore, India is less than 200 USD (complete package, including the teeth cap fittings). In case you are travelling to Bangalore, India, then you can find verified and genuine patient reviews about Renowned Dentist in Bangalore & View all the details of top dentist in Bangalore. Yeah.i am totally agree the scania bus 13 l is awesome experience.i hv taken trip from Pune to Kolhapur litterly it takes 3hrs 20 mins rather other travellers taking approx 5hrs.I am in love with this bus.Thanks scania. Volovo buses are very comfortable, i like to travel by bus from Pune to Bangalore. For long distance journey we need to book volvo bus to travel. Nice article thanks to share with us. Volvo Scania is one of the best and luxury bus. Now Online bus tickets booking made our life easy. Srinivasatravels.co.in - Tirupati tour packages from Chennai and Chennai to Tirupati car packages with starting from 1500/- with best spiritual experience at Chennai to Tirupati with one day tour. Good Blog with good Pictures, i really like it.We provides Tempo Traveller in Delhi ,Tempo Traveller in Gurgaon ,Tempo Traveller on rent in Noida ,Tempo Traveller on rent in Ghaziabad ,Tempo Traveller on rent in Faridabad ,Tempo Traveller,Tempo Traveller rent faridabad,Tempo Traveller on rent in gurgaon,Tempo Traveller hire Ghaziabad,Tempo Traveller rental faridabad,Tempo Traveller on rent in noida ,Tempo Traveller on rent in Ghaziabad for easy travel. We at Kesarinandan travels provide the best tempo traveler for rent in Pune. Our Tempo traveller services gives the best and cheap tempo traveller services in Pune Maharashtra. We are offering various options in AC/Non AC Tempo Traveller from Pune / Mumbai with different tempo traveller seating capacity at wide range of prices. We have 12 seater,13 seater ,17 seater tempo traveler on hire in Pune. We provide the best Tempo Traveller Price Or tempo traveler on hire in Pune per km. We have very good range of high class tempo travellers from Pune to Outstation. If you are organizing trip for Pune or outstation tour packages through tempo traveller we can deliver you best deal you need. We provide hassle free tempo traveller facility in and around Pune with exciting tour packages. We have various types for ac and non ac luxury tempo traveller in Pune. For all Kind of tour packages, picnics and personal uses with standard features, so you can enjoy music, watch led tv, ac interior and your complete luggage is kept securely in the storage space of the tempo traveller hire in Pune and protected seat for your children. If you are looking for Tempo Traveller in Pune and traveler with friends and family just rent Tempo Traveller from KesariNandan Travels. Great and informative post. Thanks for sharing this information. For travelers, we are also providing taxi services in all over India, more details visit our sites:- Taxi Services in Mathura, Taxi Services in Allahabad , Taxi Services in Vadodara, Taxi Services in Gorakhpur, Taxi Services in Rameshwaram .